All transactions are safe and secure with a reliable history in online purchasing behind each of our associates. Buy the Save the Cheerleader Hiro t-shirt to own Heroes clothing and merchandise. As everyone knows, part of the plot of the Heroes TV show revolves around the idea that if you save the cheerleader, then you save the world. This Hiro Heroes tee displays the quote from the Heroes episode in which Hiro travels in time and conveys his message to Peter Petrelli. 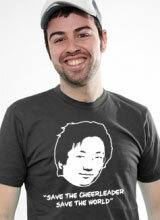 An image of Hiro Nakamura is visible with the quote underneath. The comic style design will have you uttering other Hiro Heroes quotes like, "Nobody believed me... Now I'm humanities last hope!" Purchase this with other Heroes merchandise items, such as hoodies and ringer Ts. In addition to the Save the Cheerleader Hiro tee above, browse the Heroes Clothing Gallery for more apparel like men's and women's clothes, kids shirts or hoodies.